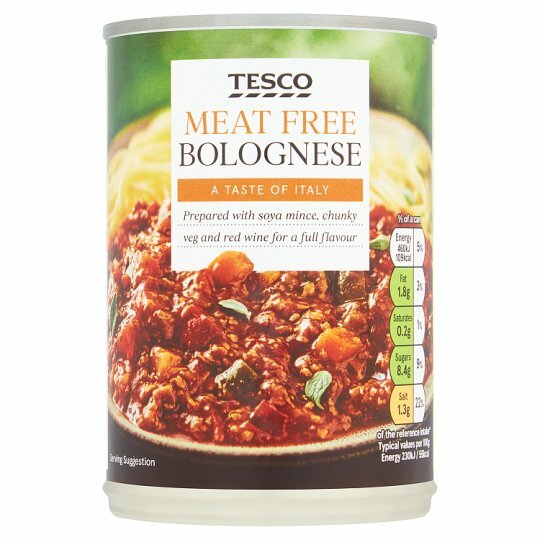 Soya mince in a rich tomato sauce with vegetables and herbs. INGREDIENTS: Tomato Purée (31%), Chopped Tomatoes In Juice (18%), Onion (10%), Red and Green Peppers, Water, Carrot, Mushroom, Soya Protein Concentrate (4%), Garlic Purée, Herbs, Sugar, Rapeseed Oil, Cornflour, Modified Maize Starch, Red Wine, Salt, Onion Concentrate, Carrot Concentrate, Chicory Fibre, Tomato Paste, Black Pepper, Yeast Extract, Garlic Concentrate, Pumpkin Concentrate, Mushroom Concentrate. Contains soya. For allergens, see ingredients in bold. Instructions: For best results, microwave. MICROWAVE 800W 3 mins /900W 2½ mins. Empty contents into a non-metallic bowl and cover. Heat on full power for 2 minutes (800W), 1½ mins (900W). Stir then heat on full power for 1 min (800W/900W). Leave to stand for 1 minute after heating. Stir well before serving.